"Lay off that stuff, I'm tellin' ya. I'm running my own family, the way I want to run it." Elmer Rice's Pulitzer Prize-winning play, Street Scene, became the basis for this American opera some fifteen years later, with a book by Rice, lyrics by the poet Langston Hughes, and music by the great avant-garde composer, Kurt Weill. The libretto follows the original play very closely, retaining much of the dialogue and the simple, street-facing tenement set. The story focuses on the ethnically diverse residents of a New York City apartment building, where the lonely Mrs. Maurrant (Ashley Putnam) begins an affair with a milk bill collector. As the neighbors gossip and kibitz, daughter Rose (Teri Hansen) tries to protect her mother from public disapproval and the wrath of her father (Marc Embree), while she begins to dream of a better future with her lifelong friend Sam Kaplan (Kip Wilborn). Street Scene is considered one of the most important works composed by Weill after he fled Hitler's Germany and came to the United States. Listening to it today, it's amazing how rapidly and completely Weill adopted the American idiom - the irregular, complex rhythms of his work in Weimar Germany are still present, but they have become part of a lusher sound inspired by blues and jazz, with definite echoes of Gershwin. The song What Good Would the Moon Be? calls the old Weill to mind with a reassuring sense of melancholy, but a different Weill is displayed by the upbeat Moon-Faced, Starry-Eyed which immediately follows. As someone more familiar with Weill's earlier work, Street Scene is an eye-opener, a welcome expansion of my personal concept of the composer's talent. Langston Hughes' lyrics might be equally impressive, if they could be heard clearly. This presentation was recorded at the Houston Grand Opera, directed for high-definition television by José Montes-Bacquer based on Francesca Zambello's stage production. The cast features a number of talented opera singers... and therein lies the rub. The Weill-composed songs are technically difficult, beyond the capabilities of many musical theater performers; unfortunately, Hughes' earthy, human lyrics seem to elude the highly-trained voices of this cast. Enunciation is frequently sacrificed for the sake of volume and tremolo effect, with the consonants given short shrift as opera singers are wont to do. This is not to say that the singing here is not impressive, but the English lyrics are often hard to hear, and I found myself wishing for subtitles (or supertitles) more often than not. The passionate singing leaves little room for nuance, and the acting suffers for it, leaving us with a production that is technically astute but emotionally empty. It's an unfortunate fact that the minor characters, approached in a more conventionally theatrical manner, become much more interesting than the main characters ever do. When Rose and Sam burst into song, it always sounds beautiful. But the energy seems to come from someplace esoteric and offstage, rather than from the characters themselves. The show hasn't dated tremendously well - New York and the theatre have undergone so much change since the 1940s that the characters frequently seem stereotyped, and the story is unabashedly melodramatic (though the songs enhance the extended ending tremendously, as compared to the "straight" version). 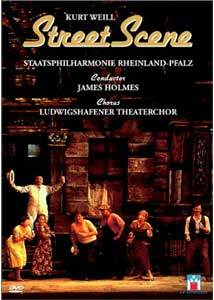 But because Street Scene is performed relatively rarely, this DVD edition of the opera remains a valuable addition to the library. Music and theatre buffs will be pleased to own this version, regardless of its weaknesses, but the definitive production remains elusive. Image Transfer Review: This production of Street Scene was recorded using HDTV equipment back in 1995. Though the technology has arguably improved since, the anamorphic 1.78:1 image here is excellent, with fine details visible on sets and faces and naturalistic, smear-free color. There are some interlacing artifacts visible when the camera moves quickly, and the stage lighting is sometimes harsh (though shadow detail never suffers), but the production has been very nicely captured and downconverted to the DVD format. Audio Transfer Review: Street Scene features two audio tracks, a Dolby 2.0 Stereo track as well as a Dolby Digital 5.1 mix. The production was recorded live, and music occasionally obscures vocals, which are often not as well-enunciated as they might be. The microphones also pick up a fair amount of stage noise, and a subtle but nearly-constant level of coughs, subdued laughter and other audience rustles distracts throughout. In a surprising turn of events, the 2.0 track is actually clearer than the 5.1 mix. I'm guessing the 2.0 mix is the original presentation, generally centered with some degree of stereo separation and decent frequency range. The 5.1 mix seems to be an electronically engineered expansion of the stereo track, magnifying hiss and incidental noise and creating an unpleasant, echo-y soundstage with artificial envelopment that robs the production of its "stage" feel. Stick with the 2.0 track on this one - as limited as it is, it's much more listenable than the 5.1 presentation. Extras Review: Image presents Street Scene in bare-bones form, with 23 text-menu chapters and a layer change placed at the act break; there's nothing here to illuminate the production, and subtitles are sorely missed despite the English-language material. Street Scene is an important American work, and this production is a valuable if imperfect record of the show. Image's DVD is bare-bones but well-mastered in the video department, and fans of the musical theatre will want to check this one out.